Platycerium coronarium (StaghornFern, Stag’s Horn Fern, Crown Staghorn, Disc Stag’s Horn Fern, Elkhorn Fern). 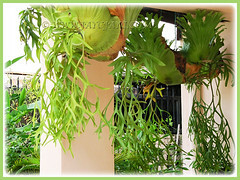 The majestic Platycerium coronarium is captivating with its lengthy, long and pendulous leaves. 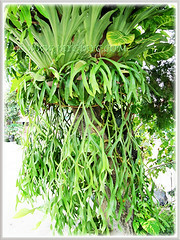 They are epiphytes, growing naturally on branches and trunks of trees in the tropical and subtropical jungles. There are popularly cultivated worldwide for their fascinating antler-like fronds. These spectacular ferns with uniquely shaped fronds will make an interesting and dazzling attraction in any garden. We have been on the lookout to buy a pot of this Playcerium coronarium but unsuccessful until now. Platycerium bifurcatum that is native to Australia and New Guinea are sold in garden nurseries instead. Botanical Name: Platycerium coronarium (sym. : Platycerium biforme). Common Names: Staghorn Fern, Stag’s Horn Fern, Crown Staghorn, Disc Stag’s Horn Fern, Elkhorn Fern. Etymology: The genus Platycerium is derived from the Greek terns platys (broad) and eras (john), a reference to the antler-like nest-fronds. The species epithet coronarium means crown, describing how the nest-fronds are arranged. Origin: Native to the tropical and subtropical jungles and rainforests of Southeast Asia, Myanmar, Thailand, Vietnam, Indonesia, Malaysia, Philippines and Singapore. Plant type: Epiphytic perennial ferns. Features: Platycerium coronarium is in the genus Platycerium that consists of about 18 species, with many hybrids and varieties.Platycerium are epiphytes, growing naturally on branches and trunks of trees. 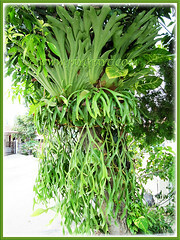 Platycerium ferns are slow-growing non-flowering epiphytes. They produce two distinctly different fronds, basal and foliar fronds. The basal fronds, commonly named sterile or shield fronds are thin, almost rounded, emerging green which then change to brown and papery as they age and grip onto the growing surface. They grow in overlapping layers, with serrated or scalloped upper edges and stand erect, forming an opened receptacle for water, dead leaves and organic debris that eventually decay and provide nutrients for the ferns. The foliar fronds, commonly known as fertile fronds, growing from the base of the sterile fronds resemble antlers of a stag or elk, hence their common name, Staghorn or Elkhorn Fern. Brownish patches of sporangia (spore-bearing structures) are produced on the underside of tips of mature fertile fronds. The fertile leaves are about 2 m long, pendulous, hanging beneath the basal fronds and consists of many repeatedly dichotomously branching parts. Simply impressive! 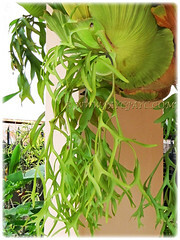 Culture (Care): Platycerium coronarium are so easy to cultivate. You just need to provide the proper growing conditions that mimic their natural habitats for optimum growth. Light: Best in partial shade or bright indirect light with good air movement. Avoid direct sun. Moisture: Moderate water. Rain water is best but soft water can be used. Benefits from high humidity and occasional misting. Soil: Not applicable as usually mounted onto a tree. However, if grown in hanging baskets, containers or mounted on wall planters, use moisture retentive medium such as tree bark, osmunda fibre and sphagnum moss. Others: No pruning needed. Feed with slow-release fertilizers, like fish emulsion. Alternatively, use potassium-rich banana peels that can be used whole or cut up and place them amongst the nest-fronds. They are generally disease free though susceptible to scale insects. For subtropical and temperate regions: Hardiness – USDA Zones 9-11. It is cold sensitive and sensitive to overwatering. Less water in winter or cooler months. During the winter rest period, water only enough to keep the fronds from wilting. Too much water in winter causes spotting of the fronds. In frost free climates, they can be grown in containers and suspended beneath large trees. Propagation: By spores or division of pups. From spores which is slow, difficult and impractical for most gardeners. The other best alternative is careful removal of pups from large Staghorn ferns and replant them. Removal: Try to remove a pup together with its root system only when it has produced its own fertile fronds for better survival rate. The fern’s roots are in the basal fronds, so use a sharp knife to cut right through the thickened pad of old basal fronds, dividing the root system well for both the parent plant and the pup, mindful not to damage their rhizome and the growing bud which is its life source. If possible, cut at least a minimum of 3 inches away from their growing points. Replanting and mounting: There are many ways of replanting/growing these pups. To mount, place some moistened sphagnum moss or similar moss at the back of the basal fronds, then fix them onto the mount with encircling fishing line, thin wire, twine or nylon pantyhose, being careful not to damage or tie over the growing bud where new frond emerges. The basal fronds and root system will eventually expand and clasp the growing surface. Check out this site with illustrated mounting instructions. 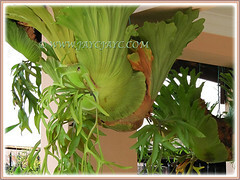 Usage Platycerium coronarium or Staghorn Ferns are excellent ornamental foliage plants. Ideal as an indoor plant. These ferns will make impressive additions to the garden and home. 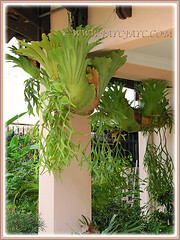 Grow Staghorn Ferns on palm or tree trunks and branches to add beauty to your garden landscape. Planted in containers, hanging pots or baskets, they will be attractive specimen in any garden, at a patio, deck or outdoor living space. These spectacular ferns with uniquely shaped fronds will make an interesting and dazzling attraction in any garden.